1.) I must say that I’m glad it’s Friday. This has been an exceptionally challenging blogging week for me. I haven’t taken many pictures, and I’ve been at a loss for blog topics. 2.) 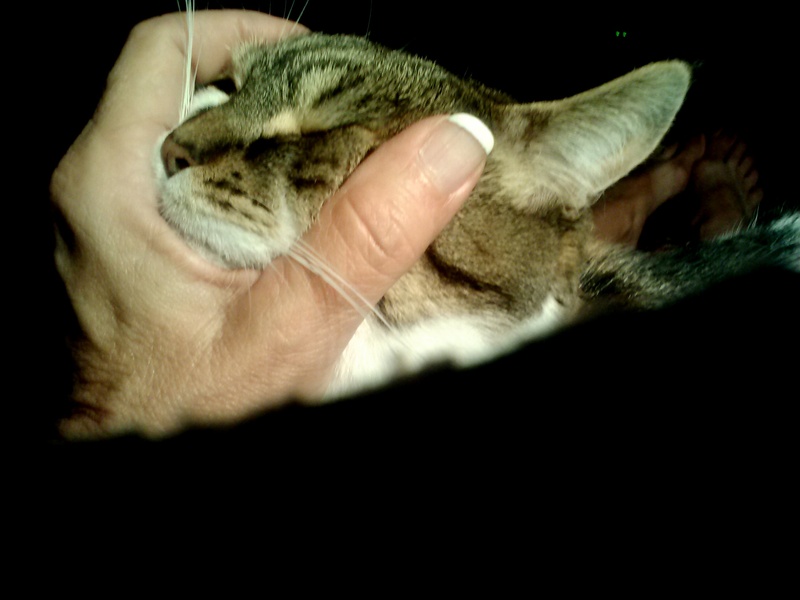 At first glance, it appears that this is some sort of kitty torture, but I’m actually giving Sundae a face massage. Eyes closed, you can tell she was completely enjoying it. She was in my lap, and yes, those are my feet in the background. 3.) 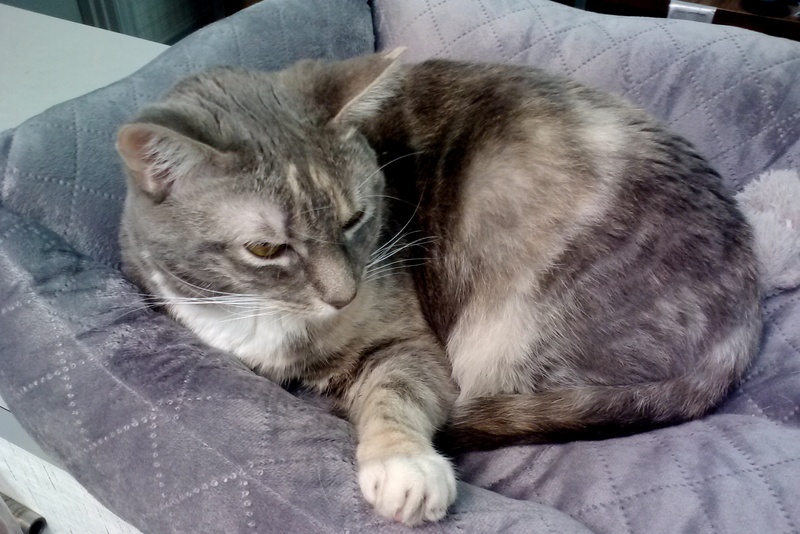 Equal time for Gypsy: she has a new kitty bed. And approved it right away. Miss Gypsy will star in her own blog post one day next week. 4.) 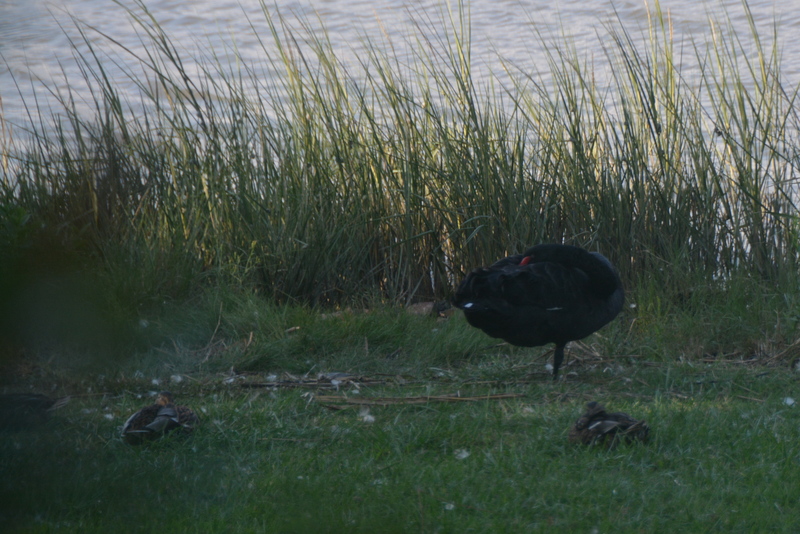 I caught Groom Swan and three ducks sleeping in our yard recently; Groom Swan standing on one leg….impersonating a sea gull, I guess. 5.) Motor Man and I are planning to attend the first ever Bacon, Bourbon and Beach Music Festival in our little town this weekend. (Two different tickets are available: one includes bourbon, one doesn’t. Since we don’t drink, we bought the latter.) We’re looking forward to the bacon and beach music, and the weather is supposed to be just about perfect for an outdoor event. Happy Weekend, and I’m hoping for easier blogging next week. 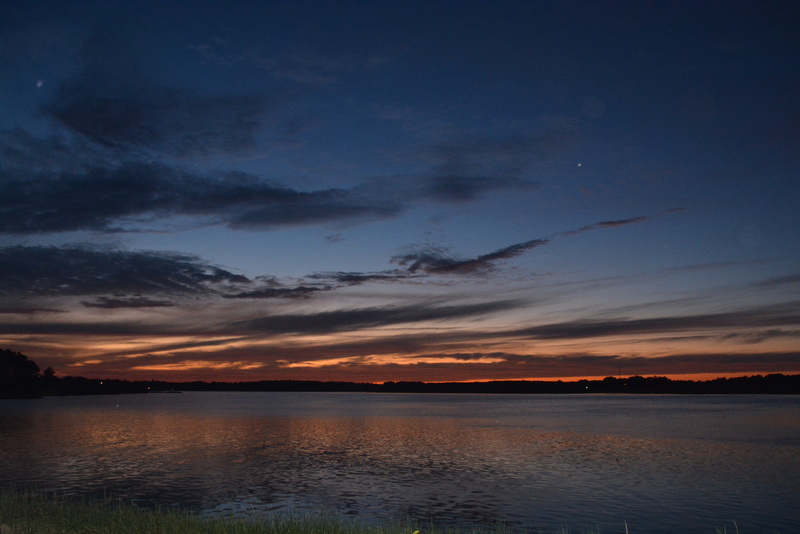 This entry was posted in Days at Home, Gypsy, Sundae, Sunrises/Sunsets, The Swans and tagged black swan, calico cat, smithfield bacon bourbon beach music festival, sunset, tabby cat. Bookmark the permalink. Sam loves face massages too…..! Have fun at the festival…..sounds like a lot of fun and you’re right – we’re in store for a PRETTY weekend up here too! T-Bob loves a good scritch along the whiskers. He would give me 30 minutes to stop that if I let him, but poor thing I think of something and bounce up to tend to it. I guess I could take lessons from him on how to keep still…mornings are best when he sits on my lap while I’m at the computer. 🙂 Have a great weekend! Have fun! Your festival reminds me of the Pine, Pork and Peanut festival at Chippokes State Park. Gosh, we like our alliteration in Virginia! Have fun, Dianna. Your festival reminds me of the Pine, Pork and Peanuts Festival at Chippokes State Park. We do love our alliteration in Virgina, I guess. Bad Word Press: it sent your comment to my spam folder! Hadn’t thought about the PPP and the BBB! The weather was much more comfy for this one than it usually is for the PPP. Yes, it sent my comment in many spam folders! Bad WordPress indeed. I know what you mean about the PPP; usually we broil at that thing!!! Random thoughts are sometimes the best!!! We couldn’t tell you struggled this week with your blog – enjoyed them and they always brighten my day. Enjoy the Bacon & Beach Music. We’re due for a pretty weekend to enjoy after the dreary week! The Festival sounds like fun!!!! Your town has the coolest stuff.. 🙂 Oh yeah… Sundae is loving that face rub.. Ah. Love that beautiful shade of pink reflected in the water. Talk to me about struggling with blog topics.. 😉 I agree with jhuber, could not tell you struggled at all! 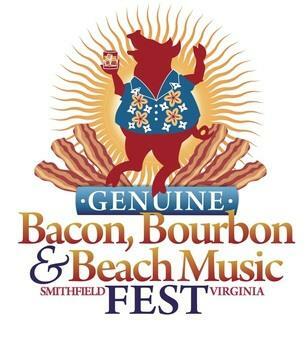 A new festival…the bacon I completely understand but wondering why they decided on bourbon and beach? I guess they only had to start with the same letter. Your blogs didn’t show any struggles! Sundae looks completely at home in your hands 🙂 I’m sure bacon & beach will give you plenty of prompts for next week ~ and if you want to take a day off – just do so! Aw, Sundae enjoys a good massage, who doesn’t?? Commiserating with you about blogging this week. I’ve been in a slump for most of September it seems. But hey, the bacon & beach festival sounds fun (we’d skip the bourbon part too). We’re supposed to have a beautiful weekend here also. Have a good one! Hmm… I haven’t tried a face massage on Snuggs… and probably won’t be ! Groom looks as “at home” on one leg in the yard as Gyp does in her new bed…..
And we’re hoping the Bacon Fest is a big hit ! Nellie loves her face massaged, Gypsy has a gorgeous bed and Burbon Bacon and Beach Music sounds like a GREAT way to spend a weekend! Marty loves to have his face massaged too. Have a great time at the festival! That facial massage looks fabulous! Maybe you could charge a bit and do people? And I can’t wait to hear about the Bacon/Beach Festival! The festival sounds like a lot of fun, and I hope you are having an awesome time at it. This was a fun ‘random five!’ I would love the festival and the music, too. Hope you enjoyed it all! Just dropping by, in my random visits. Smiles! Your kitties are so lucky and I think they know it! The festival sounds like fun, hope it was. Let’s face it, the birds love your yard!! Sounds great, and should give you more blog fodder!